Another week, another accolade for Halifax, as The Piece Hall and The Central Library and Archives scooped both the Regeneration and Yorkshire Project of the Year awards at the regional RICS Royal Institution of Chartered Surveyors(external link) Awards 2018. The RICS Awards showcase the most inspirational initiatives and developments in land, real estate, construction and infrastructure. Over 45 projects across Yorkshire and Humber were nominated for the awards, which were presented at a ceremony in Leeds, hosted by Look North presenter Claire Frisby. The transformation of Grade I listed The Piece Hall and the state-of-the-art Central Library and Archives impressed judges who said that The Piece Hall and Central Library was a stand-out ‘Project of the Year’ winner and praised the project team behind it – including Calderdale Council, LDN Architects, Gleeds and Graham Construction – for creating a vibrant new cultural and commercial centre that has attracted quality eateries, boutique and unique shops, and an array of events. The judges also recognised the project for attracting significant public and private sector funding, and for successfully combining both new build and the significant restoration of heritage assets to an exceptional standard. 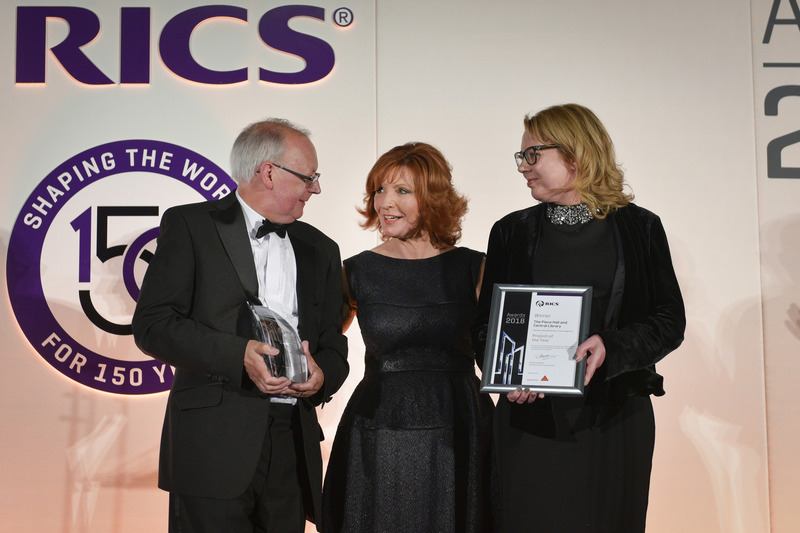 “It seems not a week goes by without The Piece Hall receiving another prestigious accolade and the RICS awards are fantastic additions to the growing trophy cabinet. “I am honoured that The Piece Hall has received these awards. The Piece Hall is a spectacular building and has been beautifully transformed, complimented by the new Central Library. “The Piece Hall Trust team has been focused on creating a destination that the people of Calderdale love and that attracts national and international visitors, offering a wide range of events, quality independent shops, bars and eateries all within this spectacular building. The Piece Hall transformation was made possible by funding from Calderdale Council, the generous £7 million grant from the Heritage Lottery Fund – thanks to National Lottery players – and support from the Garfield Weston Foundation and the Wolfson Foundation. It’s now run by The Piece Hall Trust, an independent charity, set up to run The Piece Hall for public benefit and to ensure the sustainable future of this magnificent building. The stunning new Central Library and Archives has been wholly funded by Calderdale Council and incorporates the old Grade II* Square Church building including the spire and the beautifully restored Square Church rose window. The Piece Hall and Central Library and Archives will now be entered into the national RICS awards and compete to be overall category winner and for the ultimate accolade — Project of the Year 2018 — at the RICS Awards 2018 Grand Final, to be held in London in November 2018. This entry was posted in Arts and culture, Conservation, Heritage, Piece Hall. Bookmark the permalink.